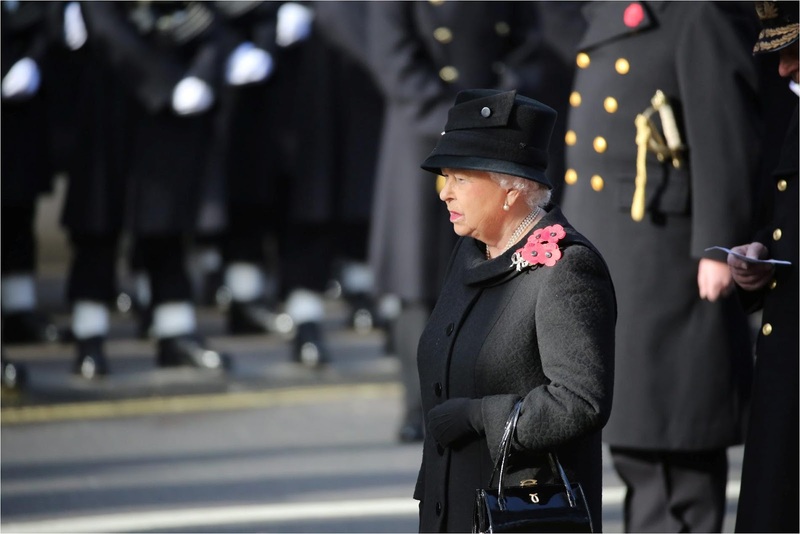 The Queen and the Duke of Edinburgh, accompanied by other members of the Royal Family, attended the Remembrance Sunday ceremony at the Cenotaph, London. The service honors those that have died in armed conflicts. The Queen kept things simple at today's service, holding her traditional cluster of poppies with her favorite bow brooch. 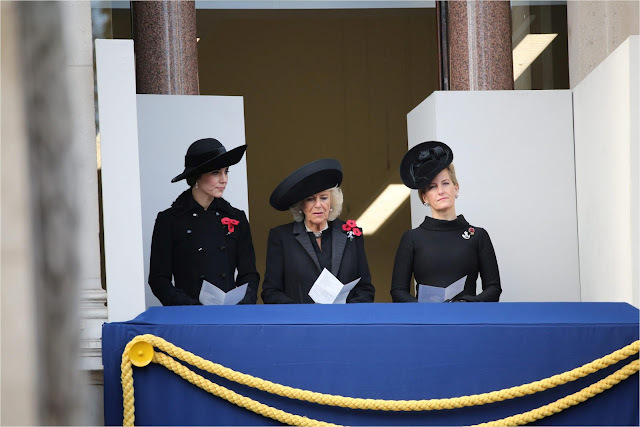 As always, she was joined by several members of the Royal Family in uniform to lay wreaths at the Cenotaph. The Duchess of Cornwall wore again her Four Strand Pearl Choker with Large Diamond Clasp, along with her Everyday Pearl Pendant Earrings. Her brooch is a regimental badge from her late father's regiment, and it formerly belonged to The Queen Mother. The Countess of Wessex also wore a regimental badge, from the Rifles. Interestingly, The Duchess of Cambridge has been loaned another piece from The Queen's jewel vault: the Bahrain Pearl Drop Earrings. These earrings were created using pearls given to Princess Elizabeth as a wedding gift. Much like the Silver Jubilee earrings recently worn by Kate, this pair has been loaned to Sophie in the past. They've also been worn fairly recently worn by The Queen herself, who chose them for last year's Festival of Remembrance.